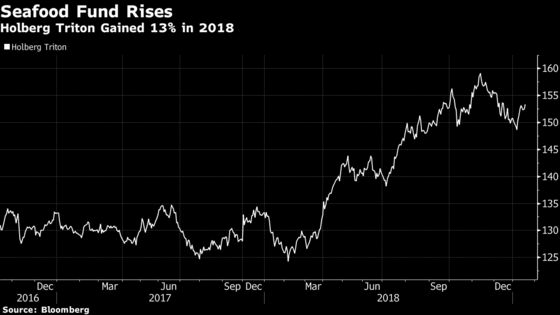 (Bloomberg) -- The top-performing stock fund based in the Nordic region in 2018 invested only in seafood. The Norwegian fund, Holberg Triton, rose 13 percent in a year when many struggled with losses. That was the highest return among stocks funds based in the Nordics, according to fund analysis firm Morningstar. With the meat industry increasingly under attack, the Bergen, Norway-based fund is hoping to capture the rising demand for healthier and more sustainable proteins from a growing global middle class. Many fish stocks have boomed over the past years, raising doubt about their valuations. But there are only so many fish in the sea and the industry is now facing supply constraints, which could help support both commodity and stock prices. The fund’s biggest holdings are Leroy Seafood Group ASA, Vinh Hoan Corp., Clearwater Seafoods Inc. and Bakkafrost P/F. While some companies “look expensive,” Holberg Triton has kept a conservative tilt on its holdings, he said. “There’s nothing indicating that it’s expensive or increased risk in relation to earnings,” he said. The benchmark Oslo OBX index has a price to earnings ratio of 13.5, compared with 12.4 for Holberg Triton’s for 2019. But one big risks looms for investors in Norway’s salmon producers: The government is currently reviewing whether to slap a resource tax and a commission will deliver its verdict in November. The review was sparked by “extraordinary returns” for the industry. Molnes said a new tax would be a misstep by the government, which is reacting to returns generated by a very narrow base of observations.